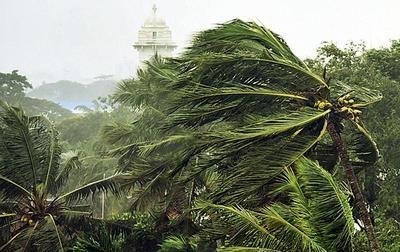 Cyclonic storm Ockhi hit the southern coast of Kerala resulting in catastrophic damage and distrupting normal life in Thiruvananthapuram. The city was affected by the Heavy rains and strong winds resulting in damage to buildings, road and plant life. Four people has been reportedly dead as a result of the incidents due to the cyclone till now. Several trees were uprooted disrupting rail and road traffic. Over 200 fishermen in 50 odd boats have failed to return to the Trivandrum, Kollam coasts. Indian Navy has been setup a rescue mission with its four ships and helicopters. Wind speed were at 120 km per hour and waves rose to a height of 4.2 as per reports. Shutters of Neyyar and Peppara dams in the regions has been opened due to heavy rainfall. Trains were cancelled or rescheduled as a result of the cyclone. Kerala Chief Minister Pinarayi Vijayan and Fisheries minister Mercy Kutty Amma said that all the necessary arrangements have been made to face the emergency situation. Schools in the district were given holiday from afternoon onwards yesterday.